Ring In The New Year With The Best Balcony View On Beale Street! Exclusive Twelve Bar VIP New Year’s Eve Celebration! 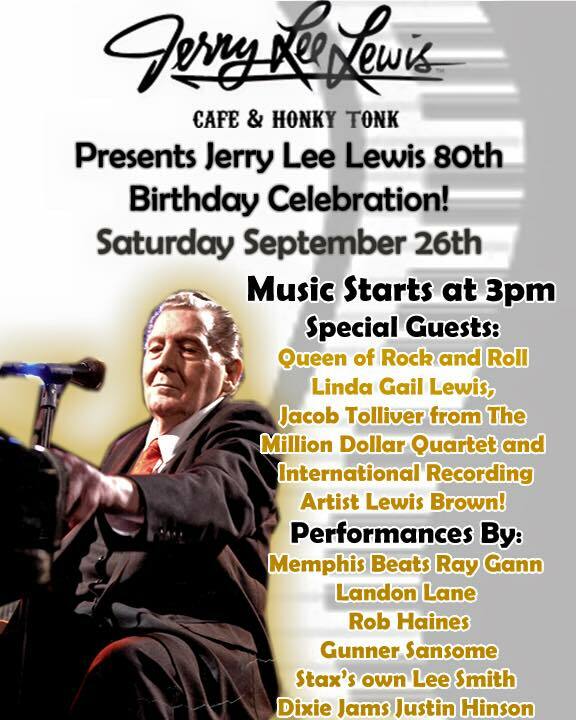 Celebrate Elvis Week 2015 at Jerry Lee Lewis’ Cafe & Honky Tonk in Memphis August 8-16 with special events, guests, live music, great food, and more! Featured performers include: Gary Hardy, Matt Joyce, Jeff Rainey, Allan Hart, Erock, and Frank Werth! Check out our Live Music calendar! Interested in coming with a group? Book our venue for a private party or event! In New Orleans, everyone knows how to party, but Beale Street knows how to keep it Rockin’! Join us as we celebrate Mardi Gras– Memphis Style! We’ll be living it up like we’re really down in the French Quarter with Beads, Masks, Feathers and more! Make Plans Now and check out our Facebook Event for all the details! Join us tonight as we celebrate the service industry with our good friends at Fireball Whisky, Firefly Moonshine, Firefly Vodka, and Buffalo Trace. We’re throwing a party that Memphis has been dreaming about for years. We’ve got the legendary Jen Lasher, DJ Tubbs, and The Jason James Trio ready to make you dance the night away. Unlimited Gourmet Nachos hand crafted by our kitchen. Not to mention the Fireball girls will be in the house with some definitely tasty Fireball concoctions. Doors open at 9pm. Be here!